On January 16, Southern Metropolis Daily reporter Tan Renwei was the first in China to report on "the beating death of Lan Chengzhang." Immediately, various media reporters from all over China converged to Datong city, Shanxi province to file reports. Eight days later, China Economic Times published the article <Behind the case of the Shanxi illegal coal mine owner beating "reporter" to death> and this is the most complete report thus far. Wang Keqin told yWeekend: "The death of Lan Chengzhang was the inevitable result of the disequilibrium in the relationship between the illegal coal mines and the local news bureaus looking for a piece of the pie." Tan Renwei told yWeekend: "Behind the incident itself, there are deeper things that remain to be uncovered and verified." The results of this reporter's investigation is basically the same as the police version: On January 10, China Trade News Shanxi bureau "special topics department director" Lan Chengzhang, his colleague Chang Hanwen and a driver proceeded to Hunyuan county, Datong City to "collect news leads" about an illegal coal mind that was producing without the required paperwork. They were attacked by a mob directed by the illegal mine boss Hou Si and injured. 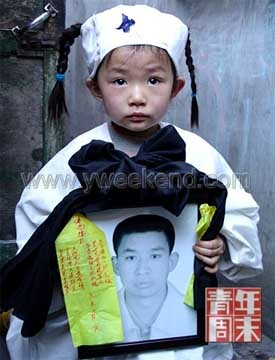 Lan Chengzhang was taken to the hospital, where he died the next day. After this case was exposed in the media, the central and provincial governments paid a high degree of attention and demanded an investigation as quickly as possible. On the afternoon of January 23, the Datong police called a press conference and claimed that the principal suspects have surrendered themselves to the police. Thus, the case of the death of Lan Chengzhang has been "successfully solved." Some media reported that the police also claimed that Lan Chengzhang had "planned to extort" the coal mine. One keyword in the Lan Chengzhang affair is "fake reporter." On the day when Lan Chengzhang died, the Datong police issued a notice to declare that all those who do not hold a press card issued by the General Administration of Press and Publications are fake reporters." According to the statement from China Trade News: Lan Chengzhang and others were "workers" hired on probation and he was supposed to be "collecting news clues" on the day of the incident. But the Lan family produced a letter of introduction from the China Trade News Shanxi bureau dated on the date of the incident, without the name of the addressee and stating that "our reporter Comrade Lan Chengzhang (one person) is gathering news at your location." A news bureau is an outside organization for a media outlet outside of its normal area of operation. According to regulations, it can only engage in news gathering and reporting and it must not engage in business and advertising sales. But that was not what happened in practice. According to a friend of Lan Chengzhang, Lan had said: "The news bureau invited me over and gave me a business sales quota of 180,000 RMB per year." Many media have news bureaus in Shanxi, supposedly more than 80 of them. Former Southern Weekend reporter Li Yuxiao said: "This is not an exception in China. This situation exists broadly at various levels of news media." Whether Lan Chengzhang is a real or fake reporter was a focal point of debate at one point, but our report was not going to be about the real/fake reporter issue itself. Rather, we want to bring out the core point about the news bureaus. That is the true key to this incident. The situation of news bureaus was caused by the "real problem" of the illegal coal mines. The two roads from the illegal coal mines and the news bureaus are obviously the cause of death of Lan Chengzhang, such that his beating death was inevitable. Thus, our whole report followed these two roads. On one hand, the illegal coal mine generate so much money that the mine bosss could afford to be indifferent to deaths. When a mine accident occurs, the boss will pay some money. The local government will try to cover up because it does not want any tarnish on its political accomplishments. On the other hand, the reporter has the "duty" to make "enough money" for the news bureau. When these two roads converge, Lan Chengzhang has no chance of survival. On one hand, there is the wealthy and ruthless mine boss. On the other hand, there is the continuous stream of real and fake reporters who want a piece of the pie. In the end, one side will lose control. The death of "Lan Chengzhang and others like him" must be said to be inevitable under this system. During our seven days gathering information in Shanxi, we went to the scene of the incident, Sihuangpu village, three times. During the day, Wang Keqin went to visit the home of village party secretary Wang Jizhi while I sneaked over to the village entrance to check out the coal field that was almost two mu in area. At the time, there were still five or six hundred tons of coal there. But party secretary Wang Jizhi assured us that the coal mine had been forcibly closed in 2002 and there were no more coal mines in this village. That evening, we went over to photograph that coal field. From afar, we could see a coal fire burning at the field and some people were transporting the coal away. We went there by car. When we observed the situation, we stopped the car immediately. The other party saw us. Immediately, they stopped, put out the fire and vanished. We wanted to go over to take some photographs. But there were no street lamps over there. We walked along the bank of a dried-up stream. Several men then came down from the coal field and headed towards us. If they hit us with a rod on when they passed us, there was nothing that we could do. Thankfully, nothing happened. During the process of news gathering, there was one unusual thing. During the several days, whenever we went from the scene of the incident at Shuigou village to Sihuangpu village where Hou Si's mine was, there was always a Tiida car following us. Usually, it would come across us and watch us pass. Then it would re-appear a while later. It was obvious that it was following us. When we went to the coal field to take photographs that night, the car was not with us. But after we took the photographs, the car appeared immediately. As we got ready to leave the coal field and just as soon as we started our car, the Tiida pulled up next to us. We didn't know if anyone informed upon us. One evening, we were interviewing people at the village store. The person in the Tiida came in, pulled the curtain apart and then stared at us for several minutes before leaving. When we went to village party secretary Wang Jizhi's home, he went there too. He was following us closely. We asked village party secretary Wang Jizhi. Wang said that this was a rental car driver who was looking for customers. We cannot be sure about this. The car has a Taiyuan license, not a Datong license. Why is a Taiyuan-licensed Tiida -- which is relatively expensive -- looking for customers in a village up a mountain pass? Sihuangpu village is a tiny village. The appearance of this person was odd. We went there three days in a row. He was there all three days, always near the coal field. He is likely not to be a local person. We were suspicious about his status, but we cannot say anything without proof. We can only say that he was wearing a police-issue cotton jacket but without any police insignia. The name of the Darenqing town party secretary at the place of the incident is Wang Zhenhai. We tried very hard to find him but we were unsuccessful. The official version was that the local government had dynamited Hou Si's coal mine before the New Year. But villagers said that the coal mine continued to produce. The inspection of the coal mines is led by the top leader. If a coal mine existed at Sihuangpu, we needed to confirm with Darenqing town party secretary Wang Zhenhai and ask for his explanation. We called him during the day and he refused to answer. We called in the evening, but the person who picked up the telephone claimed that he was only a friend of Wang Zhenhai. What we saw at the Sihuangpu village coal field was another pile of coal which did not belong to Hou Si. This meant that the incident is far more just the illegal coal mine of Hou Si alone. But what is the exact situation? We do not know for sure that this was government-coal mine collusion. But we know that Wang Zhenhai must know what is happening. But he refused to be interviewed. If we cannot contact him, then this particular line of inquiry is blocked at this point. After Lan Chengzhang was killed, all the principals went into hiding. This made our investigation very difficult. Chang Hanwen was beaten along with Lan Chengzhang. He is a principal, he is an important witness, he knows what happened during the entire incident, but none of the reporters were able to interview this person. The family of Lan gave us the telephone number of Chang Hanwen. We called, but he refused to show his face and be interviewed. In the end, we can only use the police materials concerning the description of this case. Some of the villagers were mine workers and therefore quite important witnesses. When we entered the village during the day when there are many people around, they got worried and would not say too much. One villager did not want to be interviewed and he went into hiding. We went twice to his place during the day without finding him. So we waited until night. We were afraid that he would not open the door. So we drove directly up to the entrance of his house and we went inside as soon as we got out of the car. In the end, he agreed to be interviewed. Southern Metropolis Daily reporter Tan Renwei was the first to report on the death of Lan Chengzhang. He told yWeekend: "I saw the story first as a forum post at Tianya. At the time, not a single media outlet had reported it. I immediately called my friends in Shanxi media to confirm." According to what local reporters told him: After the news that Lan Chengzhang got out, many Shanxi reporters went out to Taiyuan city Number Five People's Hospital on the morning of January 10 to gather information. But the police locked down the hospital, and there was a clash between the police and media reporters. For a certain reason, not a single media outlet in Shanxi was able to report on this case. Tan Renwei said that it was very frustrating for him. While it was easy to confirm the facts about the incident itself, many of the things that occurred at a deeper level behind the scenes could not be confirmed. There were about 70 to 80 people, including many local Shanxi reporters, which attended the police press conference. The family of Lan Chengzhang also came to the press conference. They wanted to break into the meeting, but the police stopped them. The family members were emotional and they were vocal. After the press conference was over, I went outside to photograph the family members. There were two entrances to the hotel. The family members were blocked outside the regular entrance and they were waiting for the reporters to come out in order to speak to them. But after we finished filming them, no other reporter had come out. I was perplexed. I went inside to look and found out that the police had directed the reporters to exit through the other entrance. The family prepared some materials to hand out to the reporters in order to express their doubts. One of those doubts was: the police knew who the criminal suspects were, but these people then surrendered themselves several days later. What was going on? The family members wanted to know. What is the idea behind surrendering yourself to the police? It implies that you are entitled to a reduction in the sentence, which is possibly the death penalty. The family members were perplexed. I was perplexed too, but I cannot prove anything. During this investigation, there were many things at a deeper level that one cannot confirm. This was the hardest part in my investigation. I really wanted to go after the government-coal mine collusion angle. Reporters and news bureaus go after profit because of the presence of illegal coal mines. But why do illegal coal mines exist? There must be reasons. Also, Hou Zhenyun was just was a laid-off worker. Where did he get the money to run a coal mine? All of these things are suspicious. But we cannot verify anything. It was really tough. According to the investigation of Wang Keqin, the government said that they never found any sign of production at the mine. But the villagers said that production had been going on all along. The government said that they sealed up the illegal coal mine by dynamiting it. But when we went there, it had not been dynamited. Rather, it was filled with earth pushed by a bulldozer. There were also wooden stakes buried there. If you pull out the wooden stakes, the mine can be cleared and put back into coal production. The government said that they found the mine and sealed it with dynamite. But that was not how it was. At the press conference, the police refused to answer any questions. Actually, it was just a simple case bulletin They read the press release and they left. We prepared our questions and we were ready to ask them, but we were given no opportunity. The police said that they will have no further explanation about the case. I contacted the police afterwards, but they refused to talk. I called their leader, but he refused to take my call; even if he took my call, he refused to speak. Concerning the case bulletin, it was not that I was displeased. Rather, I was not sated. Concerning the process by which the incident unfolded, the police provided many details. They also gave us a lot of solid details about the status of Lan Chengzhang and others. But it was insufficient for the overall incident. We have many doubts, but nobody would provide us with answers. Before the illegal mine boss Hou Si started the assault, he had telephoned Meng Er at a certain local news bureau. Per the instruction of Meng Er, Lan Chengzhang was identified as a fake reporter. This Meng Er is therefore the person who was said by the media reports to have "betrayed" Lan Chengzhang. People in the media circle know who this person is, including his real name. But when I called him up, he denied that he was Meng Er. What can I do? How do you prove that he was Meng Er? At the police press conference, I saw the name of the person at the sign-in sheet. He was in attendance at that press conference, but I did not know which person was him. The "case bulletin" published by the police also mentioned Meng Er. According to local media workers, this person has quite a reputation in the media circle, and it is not a good reputation. In the chain of interests related to the coal industry, there are many details. So what role did Meng Er play? This is like a piece of meat that can be cooked and eaten in various styles. Meng Er represents one style. He was among the first wave of people who went to make a living in Shanxi while working for a national media outlet. After a while, he became friends with the mine bosses. As someone who knew the industry and benefited greatly, he formed a relationship with the mine bosses in order to stop other corrupt reporters from profiting. We cannot confirm whether he is still engaged in extortion. But according to the police bulletin, he did provide a certain kind of service to one mine boss. I wanted to sort this affair out because this is related to the profession of journalist itself. At this time, we know the status of Lan Chengzhang. We know what he was doing. We know that this was an illegal coal mine. But there are many more important things that we do not know yet. We do not know if the real reporters are actually more vicious than the so-called "fake reporters" without press cards. Hou Si said himself: "If he is a real reporter, we will give him some money; if he is a fake reporter, we will punish him." What does this tell us? A real reporter can get money, because no one dares to cross a real reporter and one is accustomed to just paying him off. If we were to uncover these things, this would surely be the shame of the profession of journalist itself. But my view is that the problem is with the journalists themselves; it is the environment that corrupted the journalists. An illegal mine boss is very wealthy, whereas a lowly reporter earns very little. In Datong, a local reporter would be lucky to earn 2,000 RMB per month. But an illegal mine owner can offer you what is equivalent to a full year or even several years of salary. Many reporters did not take the money and they wrote their investigative reports dutifully for their newspapers. But the mine bosses may ignore this reporter and approach the newspaper leaders directly. Under these circumstances, the best reporter is someone who says, "I won't take your money and I won't write about you"; the second best is someone who says "I took your money and so I won't write about you"; in the end, this evolves into: "I was not going to write about you, but I am going to blackmail you in order to take your money." If this is how it evolved, then the truth will not be revealed. The core of the problem is not with individual reporters, because it is about the overall environment. Local officials will consider their personal political accomplishments or other interests derived from government-coal mine collusion and cover up such matters through taking certain actions. The individual reporter has very little power. He is just a worker at a newspaper. In this local environment, if the newspaper does not want to do real journalism, what can he do as an individual? It has been a long time since that I have seen so many media reporters gathered in one place. Phoenix TV, China Economic Times, Observe Orient weekly, Xinwen Chenbao, Chengdu Commercial News, Southern Metropolis Daily and so on; at the press conference, I also saw, Democracy and Legal Times, Reporter Observes, and two CCTV teams including Focus Interview. In my personal experience, this piece of investigation was quite successful. I received a great deal of help in understanding the facts in this incident. Of the many aids, one of them was the collaboration among the various media reporters. When an incident involves so many aspects, it was necessary to obtain information from the Datong police, it was necessary to obtain information from the mine and it was necessary to interview local villagers. I had to run back and forth quite often. Hunyuan county was 20 to 30 kilometers away from Datong city, and the coal mine was more than 10 kilometers away from Hunyuan county city. It takes a day just to go to one place. If you work by yourself, how can you hope to figure out everything in such a short time? This is not something that any one reporter can hope to accomplish. Therefore, there was a collaborative effort among all the media reporters. From the reports that were published later, I saw that the other reporters indeed provided me with the information that they had. I was basically aware beforehand about the contents of their reports. This meant that we have been quite honest and sincere in our collaboration. The information was mutually transparent, but it was up to the individual reporters to write their own reports.